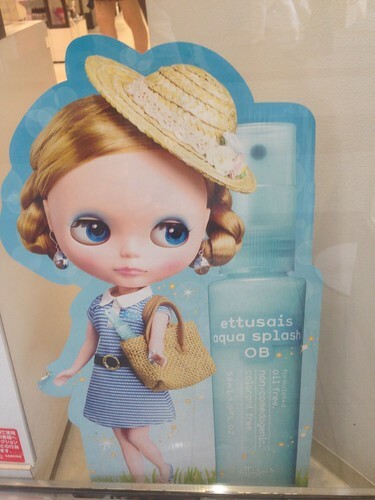 The Designer doll Blythe, originally created in the 1972 by Kenner and re-introduced in 2001 in Japan by CWC/Takara, is the spokesperson for this new cosmetics campaign for ettusais’ aqua splash OB in Japan. 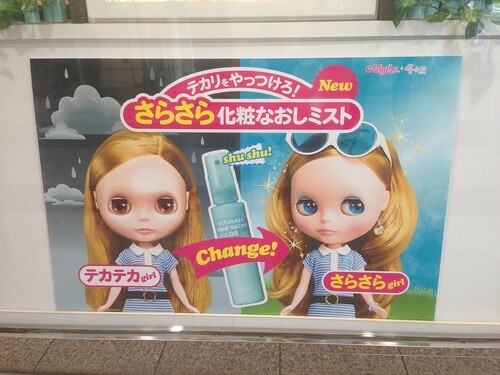 The campaign POP tells the tale of 2 Blythes: Teka-Teka(shiny) girl and Sara-Sara (Dry) girl. The product promises CHANGE from Teka-teka (which is bad apparently as demonstrated by the stormy skies and brown eyes) to the Blue-eyed Sunshine days of Sara-sara. The original Blythe doll had a gimmick where her eyes would change color at the pull of a string.